This year marks the 50th anniversary of the TV show Doctor Who. I didn't get sucked in until maybe eighteen months ago, but I really fell for this show. And I fell hard. Not as hard as Leelee who has gone total fangirl obsessed. She's pretty lucky to have friends who are also Whovians. Not to mention her siblings are pretty obsessed, too. 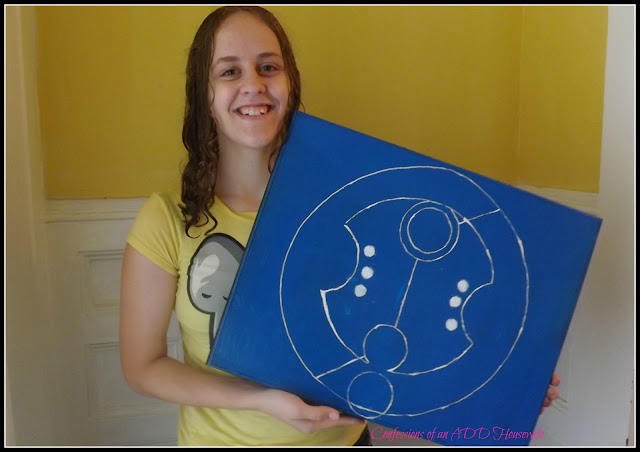 One of her Whovian friends is having a birthday and instead of buying some mass marketed Who-gear, she opted for a custom piece-- of her friend's name in Gallifreyan! We started with an awful canvas picture, then painted over it in a solid color ... one that's almost TARDIS blue. 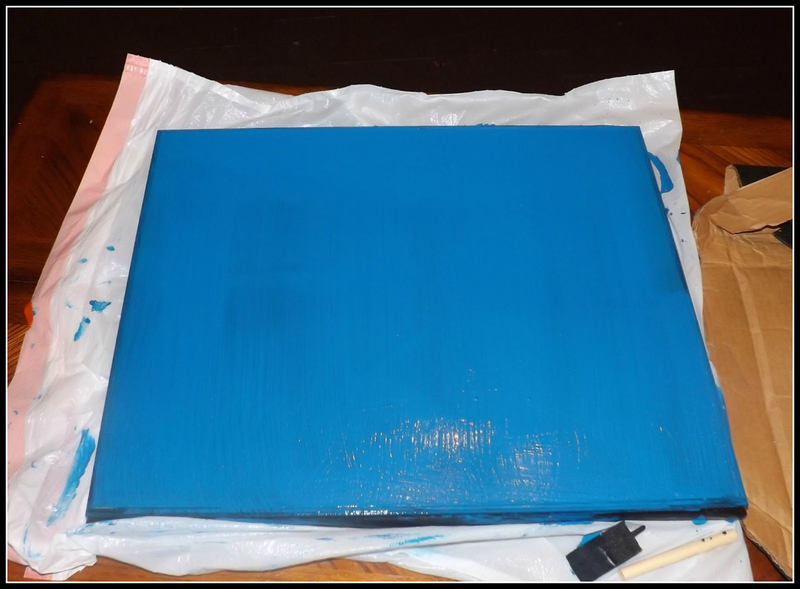 I did two coats of paint and let it dry over night. I used several circular objects, including a cheese box, a plate, a large cup and a canning lid to create all the circles! There's a great Gallifreyan Translator that will translate the names for you instead of having to figure out exactly where the circles need to go. Leelee texted pictures of the project to all her friends and the response was very positive! I mean, what Whovian wouldn't want her name in Gallifreyan? 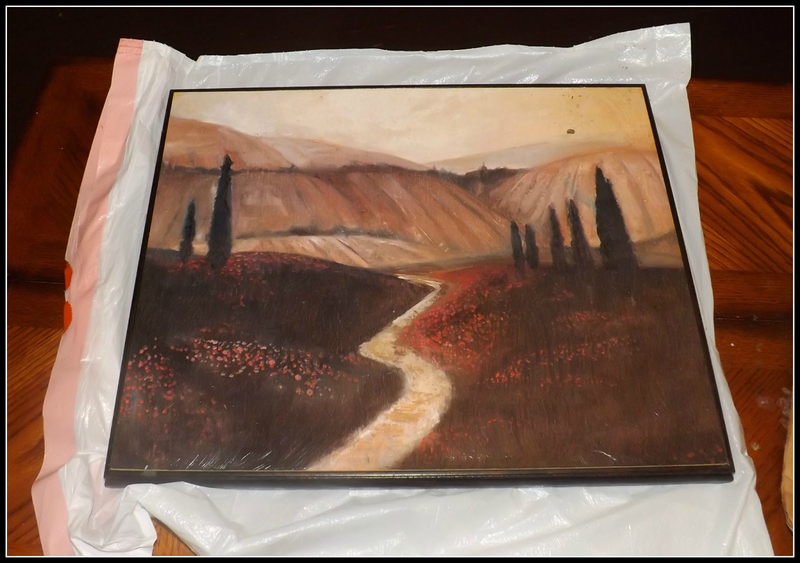 A little before and after....Cheap thrift store painting + a bit of paint + paint pen=custom art! I think Leelee's friend's name in Gallifreyan looks like some sort of armor or a shield. It's pretty cool art by itself! The useful part of this is using the thrift store canvas is cheaper than buying a brand new canvas. It's definitely something that can be done on any number of projects. Absolutely adore this project. I am a fellow Whovian and am going through withdrawals right now! I just recently became a Whovian and do a fangirl scream (complete with seal clapping) everytime I see a Tardis. New follower!!!! I want one! I want one! Please make me one! I loooooove Dr. Who!